It was a very nice place to stay in Vienna. The apartment was very clean, very worm (it was cold outside). The siting area is not close to the sleeping rooms (great if you have sleeping children). The host was great. we received information about best places to eat, to park the car, to visit. I would strongly recommend and I will stay there for sure next time. Modem spacious condo very nicely designed with all the amenities. Particularly liked the gallery outside. Everything! The room is very well-equipped, large, cozy and clean. The owner is very friendly and helpful. He thinks for us in every step of our stay and prepared everything/info before we even asked. 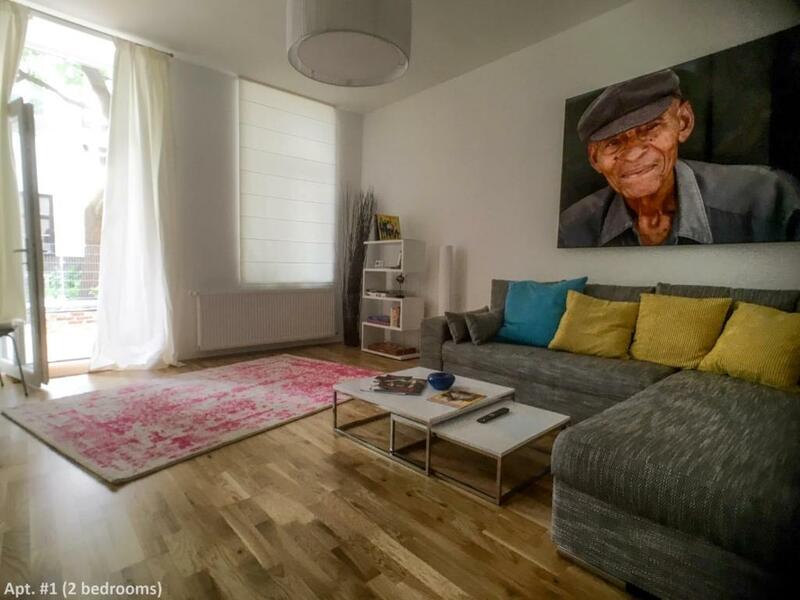 This apartment has everything you need for a nice stay in Vienna. They thought about everything, even though the place is striped of things that are unnecessary. Also, getting daily tips from Markus turned out to be a perfect solutions when searching for a good place to have a good lunch/dinner experience. We, strongly recommend staying here, when you are visiting Vienna. Amazing host, gave us good advice on where to eat around the property and in Vienna. The house had everything one can think of, very practical! We needed to do a laundry and there was a washing machine and drying lines. 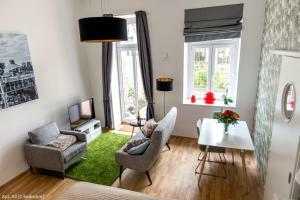 Comfortable large apartment, fine for the six of us (four adults and two children). Reasonably close to town. The host was friendly and communicative. Would stay there again. Great appartment very comfortable and clean. 2 rooms and a very big living room connected to a terrace. 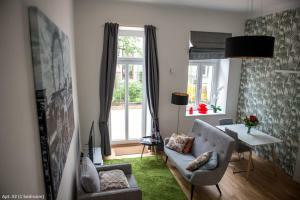 Lock in a great price for Boutique Apartments Vienna – rated 9.5 by recent guests! One of our best sellers in Vienna! Located in a quiet side street in Vienna, 0.7 mi from the Giant Ferris Wheel and the Prater Fairground, and an 8-minute public transport ride from the city center, Boutique Garden Apartments offer self-catering accommodations with a terrace and a 50 square-yard private garden. Public parking spaces can be found nearby for an extra charge. The property´s apartments are located on the ground floor of a historical building and come with a flat-screen TV, a fully-equipped kitchen with a large dining table and a Nespresso coffee machine. An iMac laptop is offered in the 2-bedroom apartment. The bathroom is fitted with a washing machine, a tumble dryer and a hairdryer. 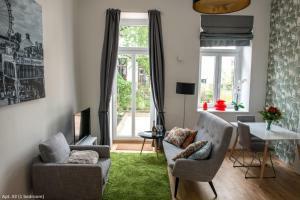 Several bars, cafés and the Augarten Park can be found within a few minutes´ walk from the apartment. A local guide is provided to all guests and free bicycles are also offered. Danube Island is 1 mi from Boutique Garden Apartments, while Messe Wien is 1.1 mi from the property. The nearest airport is Vienna International Airport, 11 mi from the property. 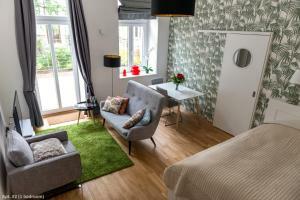 When would you like to stay at Boutique Apartments Vienna? This ground-floor apartment comes with a living room with a sofa bed, a well-equipped kitchen with a dishwasher and a dining table, a bathroom with a shower and a 50 square-yard private garden. In addition, it features a flat-screen TV, free WiFi and a washing machine. An iMac laptop is available, as well. 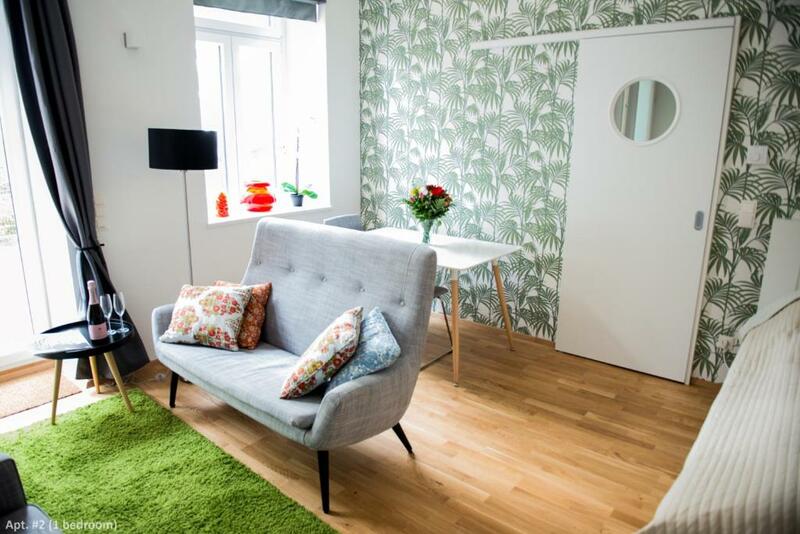 This ground-floor apartment comes with a fully equipped kitchen with a dishwasher, a dining table, a flat-screen TV, a bathroom with a shower and a washing machine, free WiFi and a 50 square-yard private garden with terrace. 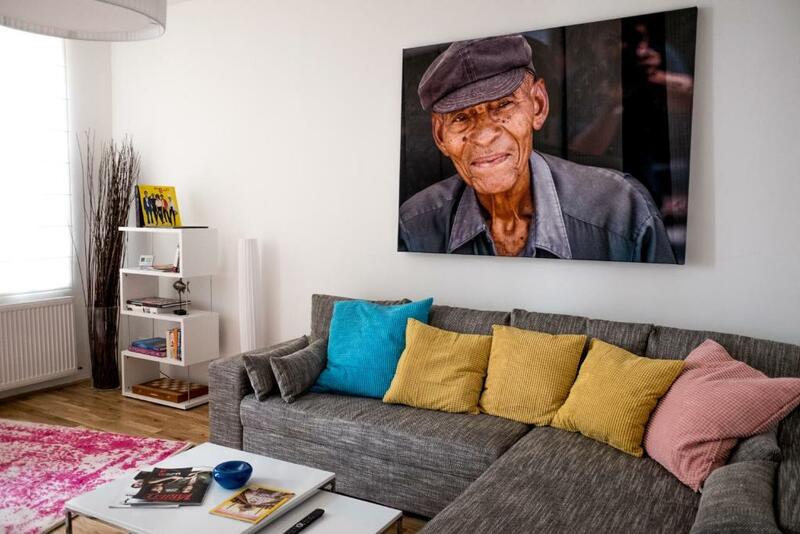 8 minutes to downtown, a young, hip neighborhood, perfectly situated, your own garden: in this new, fully furnished designer apartment you can have it all – relax and recover after a day of sightseeing, and spend the evening in a cool local bar! 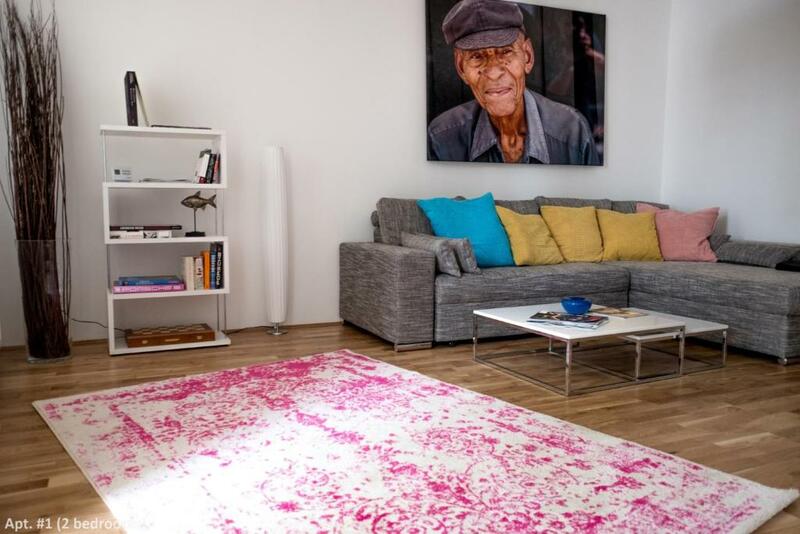 Enjoy Vienna fully in this new, fully furnished designer apartment: just 8 Minutes to downtown – ideal for sightseeing! There are lots of hip bars & restaurants in the area, and your own garden for relaxation! Do you prefer sightseeing, discovering a young, hip neighborhood or would you rather relax in a quiet urban garden? In these newly built “designer" apartments close to the heart of the city, you can have it all – for a perfect stay in Vienna. Whether on vacation or on business, whether you prefer comfort or style, for two or for a group: in these stylish city apartments with their own gardens, you can experience Vienna the way you want: Stephansdom, Riesenrad and Reed Convention Center are all nearby – as is pure relaxation in your own city garden: in this new, fully furnished designer apartment located in a hip neighborhood, you have the perfect Vienna experience. Welcome! The Boutique Garden Apartment has been completely renovated in 2016 and is rented out as a vacation rental apartment for tourists and business travelers. My name is Markus Hoefinger, I the owner of the apartment. I am born 1970 and in my bread-and-butter job I work as an entrepreuner in digital marketing (for more than 25 years now). Besides that I am interested in #photography and #travel, #skiing inwinter (a MUST for an Austrian), #windsurfing and #kitesurfing in summer as well as #technolgie, #startups and #marketing. The Neighborhood -In the hip 2nd Bezirk: Taborstraße, Volkertviertel and Volkertmarkt, Karmelitermarkt, Augarten -New bars: Nelke am Volkertmarkt, Am Nordpol 3, Bunkerei, Else und Franz Hahn (named one of the best bars worldwide!) around the corner -Food, etc: Greissler, supermarkets, pharmacy, McDonalds and many Restaurants. 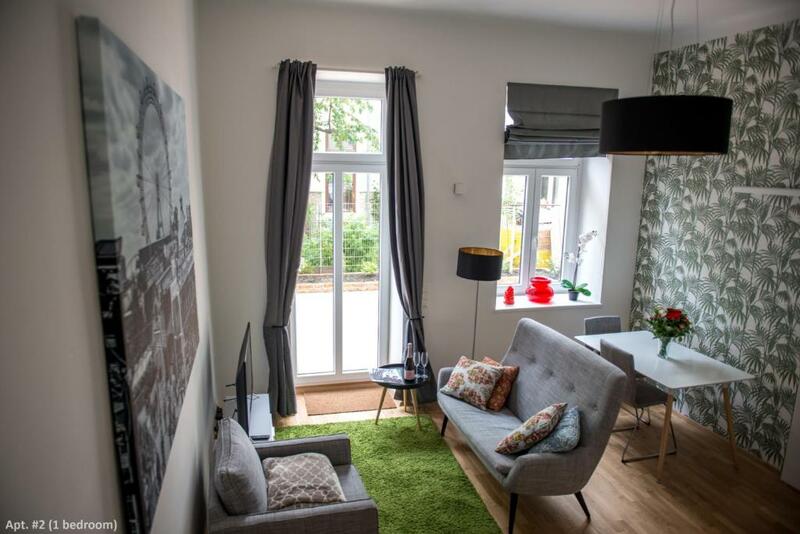 -Billa on Praterstern with extended store hours (Monday-Sunday 6:00 A.M.- 10:00 P.M.) Getting Around - Streetcar Number 2 is just 1 Minute away – goes directly to downtown (8 Minutes to Schwedenplatz) - U-Bahn Line U1 and U2 Praterstern: 1 Minute away - Night Bus and taxi around the corner. House Rules Boutique Apartments Vienna takes special requests – add in the next step! Please inform Boutique Apartments Vienna of your expected arrival time in advance. You can use the Special Requests box when booking, or contact the property directly using the contact details in your confirmation. The apartment is clean and cozy. Good bed. The owner is hospitable. Everything that is present in the house can be used. Free bicycles are also available. City center is 15 minutes cycling. The owner will mail well in advance to inform you. He also has nice tips for the city. He is easily accessible. Parking is available nearby at a parking lot for 5 Euro per day or in the parking garage Praterstern for 50 Euro per week. This apartment is a must !!! No problems. We pointed out a few little wear and tear issues with the facilities to the host who promised to fix them. But generally the facilities are in good condition. You can't darken the bedrooms. We could have done with mirrors in the bedrooms. The apartment was clean, comfortable and spacious. We appreciated the shady garden in the very hot weather. It had a bit drain smell. Amazing place. we had very nice time there.flexible check in and caring host !! would recommend it for sure and will definitely return in the future! !